Is this the keyless keyboard Apple has been working on? 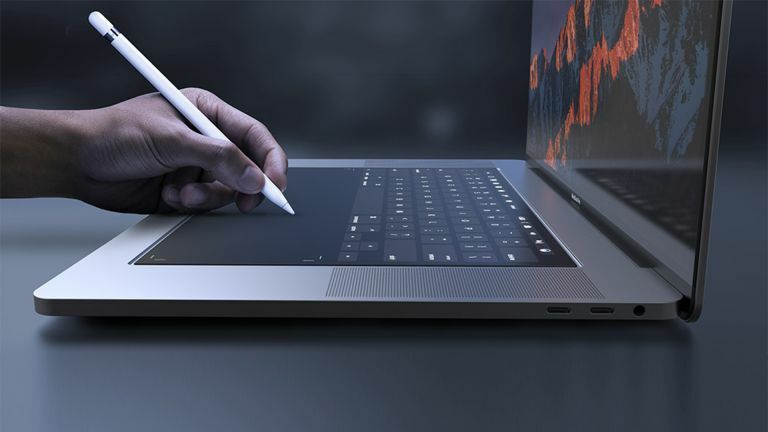 The rumour mill has churned out plenty of gems on Apple’s new MacBook and MacBook Air for 2018 and now it looks like MacBooks might be getting touchscreen keyboards. The keyless keyboard appeared in patent form at the US Patent & Trademark Office. So what’s new about this? According to the documents this is all about getting that touchscreen to feel like a real keyboard. As such Apple is looking at placing a unique haptic feedback board underneath the second display which should make it feel like real keys, sort of, when in keyboard mode. Notice that this is being called a second display. That could mean Apple also intends to use this area to make a giant single screen, for second screen multitasking and, of course, for designers to use with an Apple Pencil for editing. Could the touchscreen keyboard end up like this concept from Yanko Design? Expect to hear more on Apple’s new MacBook, Macbook Air, iPad Pro and 9.7-inch iPad at its Worldwide Developer Conference in June.